a Colorado-on-steroids-minus the hipsters-1950′s style-outdoor adventures-utopia. This means that folks were actually using rest stops to picnic and play, camping along the way, packing their lunches, actually talking to each other, putting down electronics, and enjoying the absolutely breath-taking scenery at every turn. I’ve also written on some ways to get to Alaska using Frontier Airlines as well as using Avios from Seattle along with positioning flights. Alaska Airlines’ often generous award seat availability up and down the West Coast gives anyone out there options using Delta, American or Alaska miles. 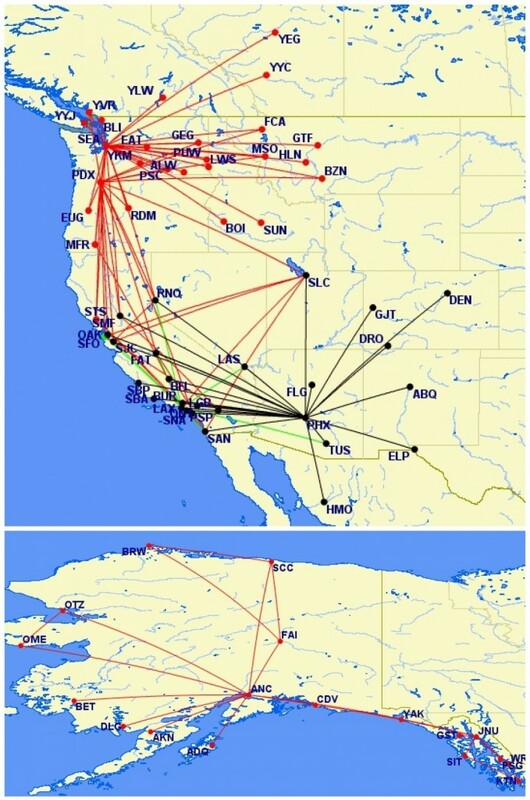 Mommy points also has a good post on getting award seats to Alaska, but there just aren’t nearly enough award seats on most routes unless you live on the West Coast. So I want to look at another way to get there on the cheap, possibly even better than free. cost 20K Alaska miles each way and allow a free stopover even on one-way travel. And best of all, seats are available on nearly every route and day, so you don’t have to book 11 months ahead or at the last minute. And changes and cancellations more than 60 days in advance are free! For 40K miles you can do a trip with a stopover in Seattle in one direction and Anchorage in the other along with a side trip to King Salmon for some up close and personal bear encounters, or Kodiak for the fishing. Or basically anywhere else in Alaska served by Alaska Airlines. Stop as long as you like in Seattle and Anchorage, and take a free day trip to some of the more remote and even more wild parts of Alaska! Map courtesy of Great Circle Mapper. Check out tripadvisor or any forum on visiting Alaska and you’ll find glowing reviews of floatplane day (or longer) trips out of Anchorage, but you can do nearly the same thing for free instead of starting at $600 per person. I suppose they provide food, but I can buy a meal or two for a lot less than $600 and then be able to explore at our family’s pace! 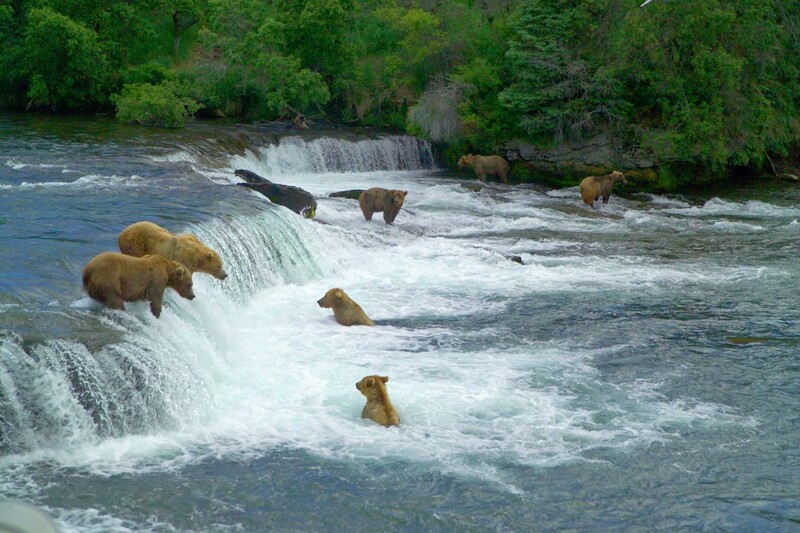 You can watch a live feed of Brooks Falls here and see salmon jumping and bears fishing, or you can go to Katmai National Park and walk right up to it! Are there better uses (as in more valuable on paper compared to the retail cost of a ticket) for Alaska miles? Of course, especially the possibilities available on Emirates and Cathay Pacific. But if Alaska is going to make it this easy to get miles and seats, this becomes another great use! isn’t for everyone. It is only for the people willing to do a little work to learn the reselling game. Just like everything else. Today, however, a tweet and post from Frequent Miler caught my eye: 18 Alaska miles (or Southwest points) per dollar at Sears! If there was ever a time to do a small amount of reselling to get your feet wet, it is a day like today. By buying Sears gift cards through the Alaska portal and then buying stuff through the portal using those gift cards you can earn 18 Alaska miles or Southwest points (or 9 of each) as well as the points you earn on the purchase with your credit card. We have done a small amount of reselling and made some money. Until you get a good grip on what works and what doesn’t, you might lose a little bit if you buy things that don’t sell. But even if you lose 10% because you miscalculate and buy the wrong stuff once, you would be paying $100 for 18,000 Alaska miles. I don’t want to do that on a regular basis but it would still wind up getting a ticket to anywhere in Alaska, with stopovers, for around $220. Reselling resources for getting started include Big Habitat (who goes over using the same type of promo for a pair of Southwest companion passes here) and Frequent Miler. I plan to use today’s promo to bump up each of the boys’ Alaska accounts from 16K to 20K miles by buying $450 in gift cards through one account and then buying stuff we need or can resell using those gift cards, through the other account. For now, probably. But Southwest has had 9X scalable to 18X several times over the past few months. If you miss this one, I’d recommend doing some homework and being ready for the next time Cartera (the shopping portal company) wants to send your family to Alaska! And of course if you want to mix and match you can regularly churn Alaska Airlines credit cards, just be sure to keep your total available credit from Bank of America low to avoid their Bait and Switch that can leave you with a useless bonus offer.